I always have a few things that just do not seem to get much attention from customers. When they have been around for a while I will occasionally remake them. 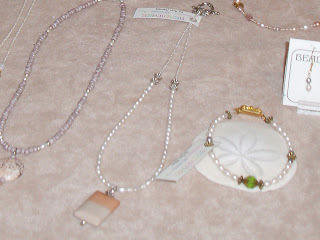 Such is the case with the pearl necklace with the pinkish desert jasper pendant in the photo below. It has a very pretty stone, but it just never seemed to attract customers. So I swapped out the pendant with a follow your heart charm, small heart and pale pink crystal. While it was not purchased this past weekend, it did get much more attention that it's former incarnation. 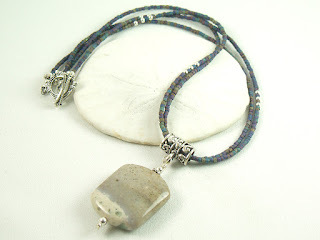 I will find another type of necklace to set off the pretty stone. And it goes well with some of my other new pearl designs. Sold. View from my Tent - Pirates! at the pirate themed Murder Mystery Weekend. I had a beautiful view out the back of my tent of the bay, ferry and Bremerton. We were entertained on Saturday by a family of young fiddlers. There were many a pirate to behold. Look closely and you will see a skeleton pirate on the right by the tree. He entertained us by scaring unsuspecting folks wandering by! A costumed participant in the sea gull calling contest. The other big color this year is supposed to be green. That is holding true in my booth. I have sold more green necklaces than ever before! Here are a few more new additions. While most of these made it thru the weekend some of my other green necklaces found new homes! 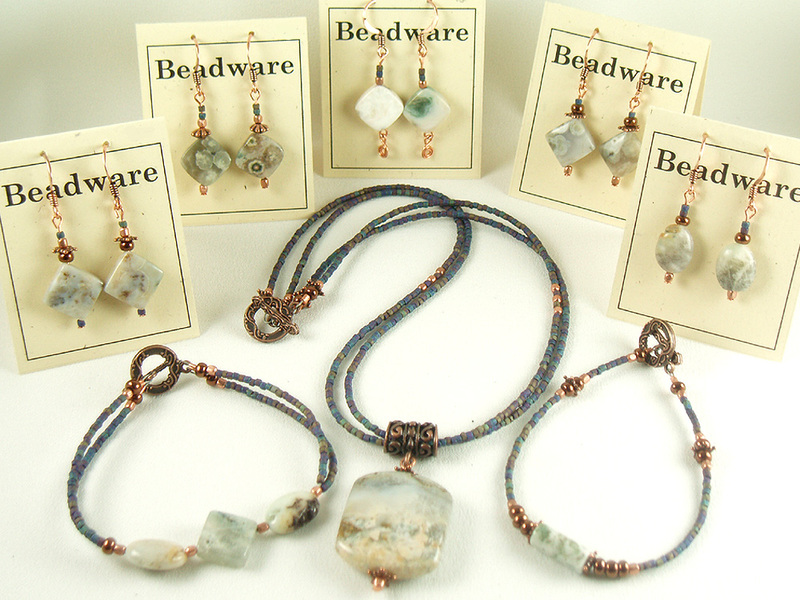 Moss agate, glass and copper or silver bracelets. These have all been sold. Ocean jasper comes in such a wide array of colors! This one has sold. 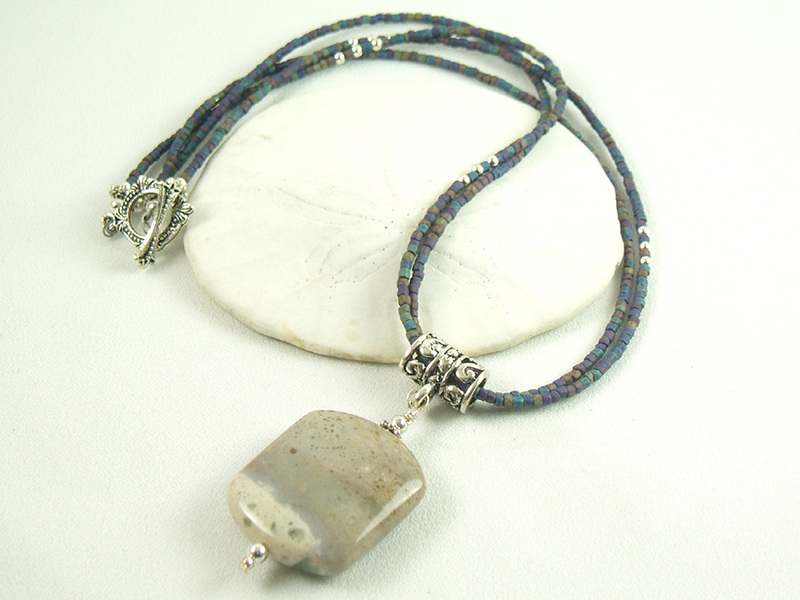 Ocean jasper necklaces. All have sold. According to the Pantone color trends for 2012 tangerine is one of this years hot colors. Think pinky orange, salmon or coral and you will have the right idea. I arrange the earrings by color in my booth and I have noticed more people than usual looking at the orange/pink selection. And I have sold more of them so far this year than is usual. So I whipped up a few more pairs for upcoming shows. These are a mix of glass, Swarovski and Czech crystals all on copper filled sterling ear wires. Yesterday I sold one of my glass gardens and a matching pair of earrings to a woman in Illinois. Yipee!! A high. Then late in the day I heard from my best show that I do every year - best in that I sell the most things and bring in the most money - that they wait-listed me this year. A low. For those not in the vendor biz - when you apply to a show there is usually some kind of jury process - you send in photos and descriptions of your things (usually limited to 3 photos) and one photo of your booth set up. Then you wait to hear if you were selected. And you hope if you don't get in that they let you know in time to apply to some other event. If they say no hopefully you have other options and you repeat the process with the next show. Sometimes you get put in this limbo state of wait-list. That means they like your stuff, but don't have room for you unless someone cancels and you are an appropriate replacement. This goes right up until the date of the show. When this is how you have chosen to make your living it can be a bit stressful! And getting into s show does not guarantee you will be successful. It is dependent on the weather, where your booth is located, the type of people who show up at the event, is it a pay weekend, etc. A total crap shoot as some would say. So now I need to decide do I leave this big hole in my show schedule hoping I get called off the wait list - or do I move forward and commit to another show?? The one I am considering is clear over on the other side of the state. Their deadline is June 1 so I have to decide quick. And once you commit - your vendor fee is not usually refundable. Then again - I do have a second booth setup, if I can find someone to do a second booth for me then I can cover all my bases. As I mentioned in my last post, many findings (clasps, ear wires, bead caps, etc) used to be made with nickel. Since so many people are allergic to nickel many manufacturers are now using brass as a base metal for plated items. Brass is made up of a mix of copper and zinc and is a good surface for electroplating. Allergies to copper and brass are rare. The majority of the findings I use are electroplated, either silver or gold, over brass. I have also begun using copper filled sterling, which is silver electroplated over copper. In electroplating a coating of silver or gold is chemically deposited on base metal. The coating layer is then bonded to the base metal via electric current. The quality of plating is determined by the thickness of the coating. For silver-plated items they can also be given a coat of lacquer to prevent tarnishing. Yes, silver plate does tarnish - it is silver! Choosing to use plated findings allows me to keep my prices very affordable and I feel it does not sacrifice quality. I have sliver-plated earrings that I have worn for many, many years. A few have become discolored with a patina, but most look just as they always have. Please visit this post that I did last July to learn more about silver plate. Brass is 70% copper and 30% zinc. Gunmetal is 85% copper, 5% tin, 5% lead, 5% zinc. Often plated over brass or surgical steel. Surgical and stainless steels are slightly more gray than silver. Mixture of steel, chromium, and nickel. Surgical stainless steel used in jewelry has approximately 8% nickel, but it is so tightly bound that it cannot leach out and this is why it is recommended for people with metal allergies. Pewter includes any of the numerous silver-gray alloys of tin with various amounts of antimony and copper. Most products are made with a lead-free pewter and have a surface finish over the pewter. "Antique pewter" or "antique brass" may be brass or zinc with an antiqued pewter or antiqued brass plating. In nearly all cases, these zinc or brass alloys meet lead-free criteria. Gold or Silver plate is a very thin deposit of real gold or real silver, electroplated or electrochemically applied to the piece. It about 1/1,000-1/1,000,000 of an inch thick. Heavy electroplate might be 2 or 3/1000s of an inch thick (this can also be written as 2 or 3 mils). Niobium is hypoallergenic and is a great alternative for people who are sensitive or allergic to other metals. Represented with the symbol Nb, it is mined from the crust of the earth. Because it is such a rare metal, it is worth several times the value of silver. In jewelry niobium is put through an anodizing process that brings out the metal's characteristic iridescence. The colors do not rust or come off, but may become dull over time. Niobium jewelry, though sturdy, should be treated gently. Clean it with soapy water and dry it off by rubbing it lightly with a dry towel. So many customers come into my booth and tell me they are allergic to various metals. Because of this I have been doing some internet research on metal allergies. While I am by no means an expert, I thought it would be worth sharing with you some of what I have found. Statistics indicate that metal allergies affect about 12% of the population. A very common metal allergy is to nickel. Many findings (clasps, ear wires, bead caps, etc) used to be made with nickel, but manufacturers are now using brass instead. Brass is a mix of copper and zinc and is a good surface for electroplating. Copper or brass allergies are rare. Nickel-testing kits are available through dermatologists, pharmacists and online and do not require a prescription. Simple to use, you place a drop on a cotton swab and rub the jewelry. If the cotton turns pink, nickel is present. The solution is not harmful to your jewelry. Be aware other items may also cause nickel allergy. They include cell phones, eyeglass frames, coins, zippers, door and cabinet hardware, tools, metal buttons and snaps, and some fabric finishes. 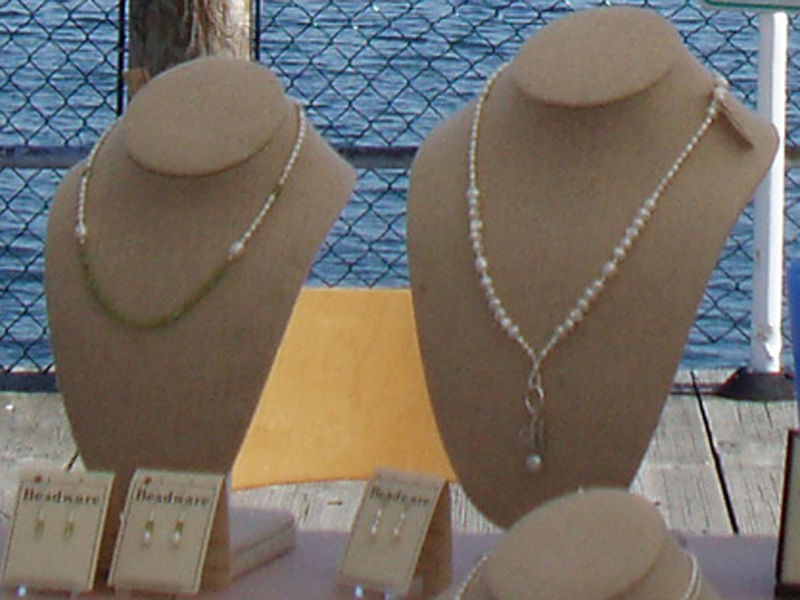 Other jewelry options for those with nickle allergies are niobium, sterling silver, 14kt gold, or plastic ear findings. Be careful of things that say they are “nickel-free” as most of these items will contain a very small amount of nickel! There is not yet a U.S. standard for this. Niobium ear wires come in bright blue, purple and green. You can also try painting the offending part with clear finger nail polish or other coatings sold in jewelry or bead stores for this purpose. They will wear off over time and need to be re-applied. The next post in this series will be about some of the other metals I use. If jewelry you’ve been wearing for years suddenly causes a reaction – medicines or hormone changes can alter body chemistry and change the chemistry of your skin oil or perspiration. Blue and copper. This combination says casual and blue jeans to me! This necklace and the bracelet have sold. During the spring and summer it is hard for me to get things photographed and shared before they are sold. This one has sold. Unfortunately I am out of these cool matte blue/rust seed beads. I will have to come up with a new combination for the remainder of these stones. This one features silver instead of copper. It reminds me of a beach. Very serene and calming. This is a longer necklace. The dangles are recycled from a broken necklace I found in a parking lot! 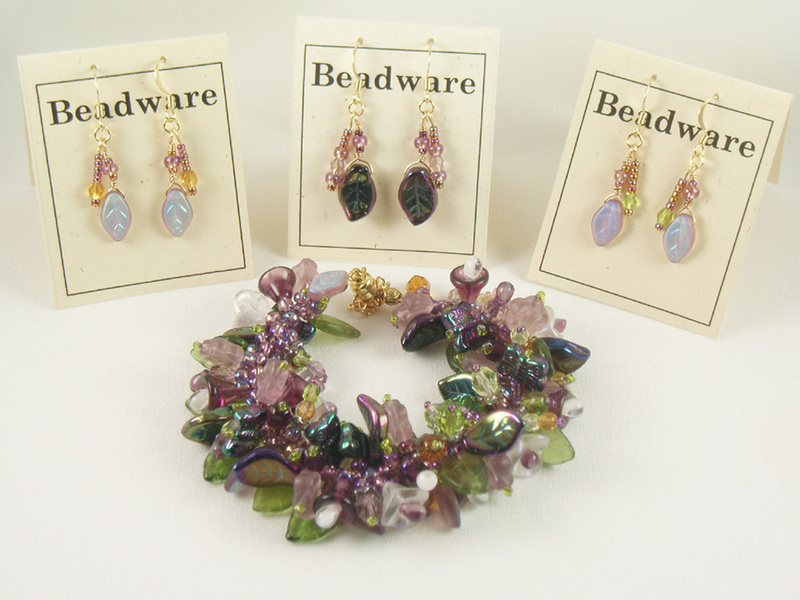 I am often given old or damaged jewelery to re-make. It can be fun and challenging.This one has since sold. Pearls and peridot. This says spring to me! Pearls with a pale blue agate. This one sold before I got a decent picture of it. I hope I have enough materials to make another. 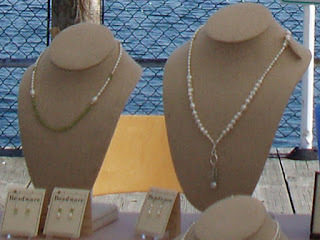 No it is not pearls, just one last turquoise necklace, bracelet and earring set. The pendant is magnesite.All have sold. View from my Tent - Boats! This past weekend at the Olympia Wooden Boat Fest I was surrounded by boats! Across the isle from me was Dog Gone Sailboats. party favors and placecard holders and even pirate ships on wheels. Out the back of my tent I had a gorgeous view of pretty wooden boats and the Olympic Mountains. Green has been a popular color this year. My first show I sold most of my green necklaces so I made a few more for this past weekend. Several of them sold the first day of the show. The pendants are jasper. 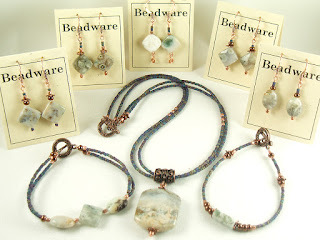 The smaller green stones are moss agate. All have since sold. One of the trademarks of my jewelry displays are the black shutters I have been using for more than 10 years. They are vinyl, purchased from a home improvement store. They have held up great over the years. I had been using black foam core for the backs - lightweight, but now that I spend so much time outdoors, they were warping from the humidity and the black duct tape I used to attach them melted on hot summer days. Thanks to my friends at Shoji Designs I now have new improved shutter backs made from a material called lumasite. They use the material in the creation of some of their custom made Japenese shoji. Visit their website and take a look at their beautiful work. They cut the panels to size for me and then I spray painted them black on one side. I attached them to the shutters using wood strips and screws. The new backside. A little paint bled around from the front and sides which were spray painted black. But not enough to worry about, it is the back after all! Clean sides! No more messy black duct tape. And the black painted fronts look very sleek as they peek through the slats in the shutters. I am very happy with the finished product. They are working beautifully. They are heavier so I had to figure out a new way to transport them and my arms will get a good workout this summer! Many thanks to Shoji Designs!! Now that my show season has started it is time to bring back this fun series of posts. Last weekend I had a booth at the Wenatchee Apple Blossom Festival. A few doors down was a collection of really neat garden art. Boy one of those would sure look good in my garden. Across the way was Miss Hannah's Gourmet Popcorn Company. I had fun visiting with Michale and Linda all weekend. They gave me a bag of their Snickerdoodle popcorn - yum!! I also tried the Kickin flavor - wow it was hot!! Made with habanero peppers, no wonder! Their company is named after their daughter Hannah. They are from Tualatin Oregon and spend the summers traveling around to various events in the northwest.